Together, in the biggest upset of personal choice write-in ballots on the voting machines, you the third ward Hoboken voter spoke and your voice was heard. 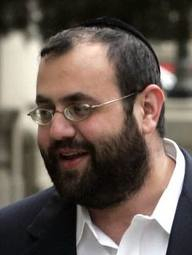 You chose a top of the heap criminal not the two-bit variety who covers up four million stolen parking meter quarters or when bribed says make out a paltry $5,000 check to "Russo for Hoboken" for a zoning variance. 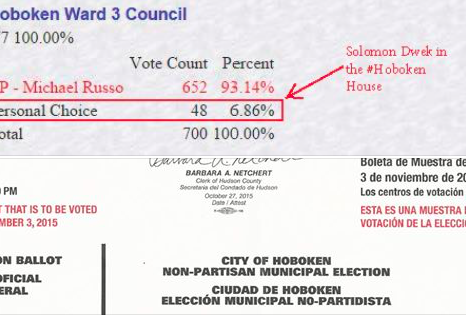 Together, we took almost 7% of the vote with the none too easy write-in process, yet cleaned up topping all personal choice charts across Hoboken combined! But enough of the past, this campaign is about hope and our mutual desire to turn the clock back to Hoboken's golden days when everything not nailed down was available to the connected at the bargain basement price of "free" and we're not limiting it to gas, tools and tires at the Municipal Garage. We heard your call for "the good stuff" and in turn you heard our campaign's call to back a winning FBI informant over a two-bit garden variety Old Guard crook. Your support has touched many and I will continue to seek your trust and make Hoboken our kinda town again as soon as Anthony Romano leaves that affordable housing unit I'm qualified for and I can move in as soon as possible. When I do, we'll begin work on a winning ticket of the most ethically challenged candidates who know how to cut through things like red tape and the law to get you the good stuff you deserve. Imagine a ticket in 2017 with me paving the way for mayor and at-large ticket with Carmelo Garcia, Beth Mason and Johnny Krime. Inez is already chomping at the bit to be our treasurer. She's done such a magnificent job in that role for Beth and the Real Crooked Dems for Hoboken, I'm sure you'll agree, it's hard to imagine anyone better! While I'm not at liberty to tell you more about our plans, that should keep all of you plenty excited until the big day comes when we announce we're taking Hoboken back! This story comes courtesy of all those who supported Solomon Dwek on Election Day. On behalf of Operation Mayhem, Da Horsey thanks you.